For those who think they know what to expect from Carrie Underwood on her fourth album, prepare to be "Blown Away." Co-writing eight of the 14 tracks, Underwood delivers her most adventurous album yet, tackling a variety of emotional topics, including abuse, infidelity, revenge and regret. It's been nearly two and a half years since Underwood's last album, 2009's "Play On." Since then she married NHL star Mike Fisher, but anyone expecting a collection of happily-ever-after love songs will instead find songs that draw from a deeper, more colorful well. In two of the first three tracks, villainous characters meet their demise courtesy of the folks they've wronged. Of course, the whole album isn't dark and sinister. "Blown Away" is a rich tapestry reflecting the complexities of the human condition, from the poignant "Forever Changed" to the upbeat island-flavored "One Way Ticket" and the sassy lead single "Good Girl." Underwood's voice is a force of nature. She belts the rockin' tunes with power and conviction, yet is equally compelling on the softer emotional ballads. In an already impressive, multi-platinum career, "Blown Away" is a landmark achievement. Which tracks on "Blown Away" are highlights? Check out our track-by-track breakdown of Carrie Underwood's latest. 1. "Good Girl" - Currently at No. 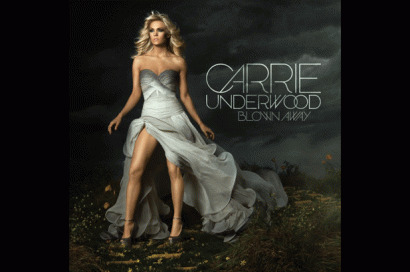 8 on the Hot Country Songs chart, this lead single is a feisty, uptempo romp that finds Underwood issuing a warning about a guy who isn't at all what he seems. 2. "Blown Away" - Mark Bright's brooding, atmospheric production and Underwood's bold performance elevate this cinematic tune to an instant classic. When the girl shuts herself in the storm cellar, leaving her alcoholic father passed out on the couch in the path of a twister, you can almost feel the wind. 3. "Two Black Cadillacs" - A wife and a mistress strike an unlikely alliance that proves deadly for a cheating cad. 4. "See You Again" - Underwood is no stranger to songs of faith, and this tune about reuniting with a loved one is truly a taste of heaven. 5. "Do You Think About Me" - A sweet tune with a catchy chorus. The lyric finds a woman thinking about a past love long after she's moved on. 6. "Forever Changed" - A stunning ballad about the fragility of life and the relentless march of time. Underwood tears up just talking about it. Listeners will reach for the Kleenex. 7. "Nobody Ever Told You" - A positive, life-affirming anthem wrapped in a buoyant melody. It's sure to build self-esteem, particularly among younger fans who need to hear this message. 8. "One Way Ticket" - It's impossible to take life too seriously when listening to this breezy, Calypso-flavored number about finding your personal bliss. 9. "Thank God for Hometowns" - Sweetly nostalgic, this tune finds Underwood extolling the virtues of small town life. 10. "Good in Goodbye" - Penned by Underwood, Hillary Lindsey and Ryan Tedder, "Goodbye" a beautifully crafted look at a bittersweet reunion between two lovers. Underwood's amazing vocal performance captures every emotional nuance. 11. "Leave Love Alone" - A cool, swampy vibe underscores the sense of emotional abandon in this confession about being addicted to love. 12. "Cupid's Got a Shotgun" - Brad Paisley's stellar guitar-playing adds to the sense of fun on this engaging romp. 13. "Wine After Whiskey" - Underwood's vocals make the heartache achingly palpable on this stone-faced country ballad of lost love and regret. 14. "Who Are You" - This sweetly soaring tune can be interpreted as a pop/country love song or a faith-filled worship anthem; either way, it's a nice finish. Little Mix, Emblem3, Fifth Harmony: Who Will Rule The Summer?